Manager Keith Curle has revealed both his admiration and appreciation of the support his team receive from Cobblers fans, describing their recent efforts at Notts County on Saturday as ‘phenomenal’. 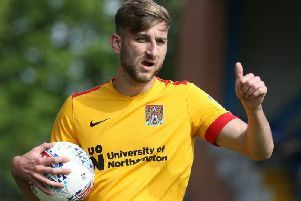 Despite looking set for a mid-table finish and having precious little to play for with six games of the season remaining, an impressive 934 Northampton fans made the 130-mile round trip to Nottingham for Saturday’s 2-2 draw at Meadow Lane. They were a vocal presence throughout an entertaining and action-packed encounter as the Cobblers recovered from 1-0 down to lead 2-1 through Daniel Powell and Sam Hoskins, but Kane Hemmings salvaged a point for 10-man County. “It’s phenomenal support, phenomenal,” said Curle afterwards. “When I came out for the game and saw the attendance I thought ‘that is real support’. It’s phenomenal support, phenomenal. When I came out for the game and saw the attendance I thought ‘that is real support’. Meanwhile, on the game itself, midfielder Sam Foley said: “We’re very disappointed. It feels like a defeat for the lads and it seems a recurring theme for opposition teams to have a man sent off and us not make the most of it. “It can be difficult to play against 10 men and we’re finding it really hard at the minute. It’s hard-luck story but it’s in our own hands and we only have ourselves to blame because we had enough chances to win several games out there.